I think, therefore I art! 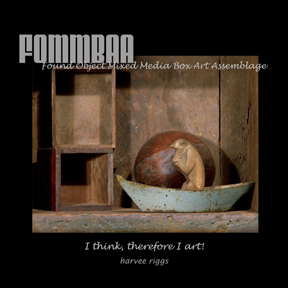 FOMMBAA (fom’-ba) is an acronym for Found Object Mixed Media Box Art Assemblage. Blurb.com in both hardcover and softcover editions. Makes a great gift! Preview the book by clicking on the Blurb link below. Free Button/Magnet Offer: If you purchased a book from Blurb, Thank You!!! These beautiful volumes contain works by numerous mixed-media artists. The artists are the winners of juried competitions, one drawn from American entries and one drawn from world-wide entries. To preview each volume please click the book title below.